Around 700 BC, the Bronze Age people we call the Villanovans started to get ideas from the Greeks and Phoenicians who were sailing around the Mediterranean. They started to do things the way the Greeks and the Carthaginians did them. Historians call these people the Etruscans (ee-TRUSS-kins). Where did the Phoenicians come from? People used to think that Etruscan people came from someplace in West Asia, because the Greek historian Herodotus tells a story about some people from West Asia, the Lydians, who might have been the Etruscans. Herodotus says that these people fell on hard times, and didn’t have enough to eat. Now these people loved to gamble with dice. So the Lydians decided to only eat on even days, and on the odd days they would gamble, to take their minds off how hungry they were! But the famine went on for years. Herodotus says that after a while these people decided that half of them should go look for a better place to live. He says these were the Etruscans, and they settled in Italy. But now most people think that Etruscan people always lived in Italy. 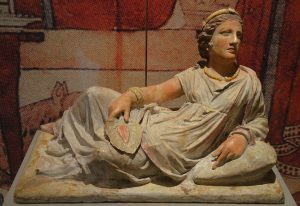 The Etruscans lived mainly in northern Italy. Because they were learning from the Greeks and the Carthaginians, they learned how to do a lot of things that the Latins living around Rome didn’t know how to do yet. The Etruscans built cities with stone walls. They built big stone temples and they put big statues in them. They dug canals and ditches to irrigate (bring water to) their fields. And they had organized governments with kings. They could read and write, and swim. Soon other people in Italy copied the Etruscan ways of doing things. About the same time as the Etruscans, a lot of Greeks also came to make Greek colonies. At first they were probably mainly trading posts. But later Greek people settled down there and began farming. The Greeks settled in southern Italy, where they took over most of the Etruscan land there. They founded the city of Naples, which became an important port (and it still is today). 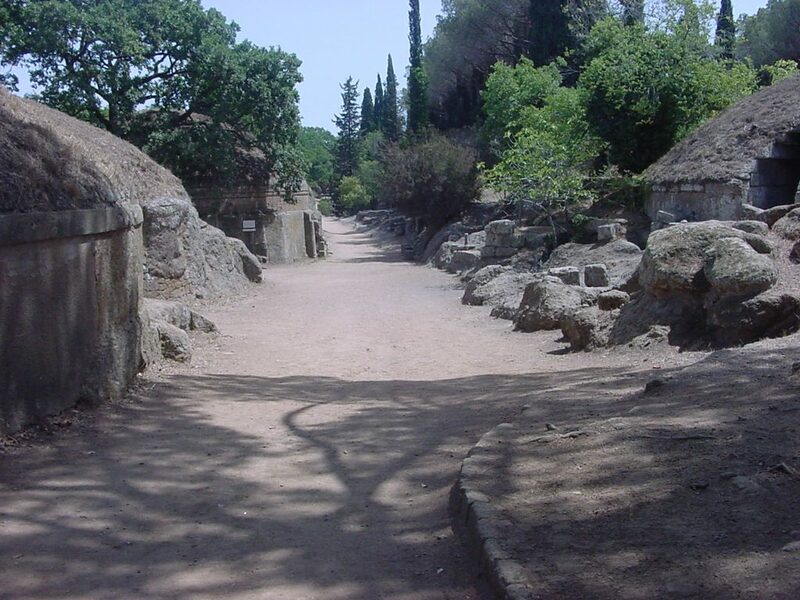 Etruscan tombs at Cerveteri. The Etruscans built their tombs to look like their houses. The Etruscans traded a great deal with the Greeks and with the Carthaginians and Phoenicians. Etruscan traders sent lumber, furs, and probably slaves to West Asia and to Africa. They bought jewelry, pepper, medicines, perfume, wine, and Greek vases. Most of the Greek vases we have in museums today were found in Italy, in the tombs of Etruscan people! What was Greek pottery like? The city of Rome lay between the northern and southern parts of Italy where the Etruscans lived. Because it was a good place to cross the Tiber river, the Etruscans wanted to control it. For a while, Rome may have been under the rule of Etruscan kings. These kings, like other Etruscan kings, made people build strong stone walls and stone temples and canals for water. Vulca the Etruscan, by Roberta Angeletti (1999). Easy reading. The Etruscans, by Don Nardo (2004). Easy reading. Hands-On Ancient People, Volume 2: Art Activities about Minoans, Mycenaeans, Trojans, Ancient Greeks, Etruscans, and Romans, by Yvonne Merrill (2004). Easy reading. The Etruscans, by Graeme Barker and Tom Rasmussen (2000). A good general account. The Beginnings of Rome: Italy and Rome from the Bronze Age to the Punic Wars (c. 1000-264 BC), by Tim Cornell (1995). A little more specialized. Cite this page: Carr, K.E. Who were the Etruscans? History of Italy. Quatr.us Study Guides, September 3, 2017. Web. April 19, 2019.